Security officials at San Francisco International Airport issued a lockdown in one of the terminals on Sunday evening, according to an airport spokesman. 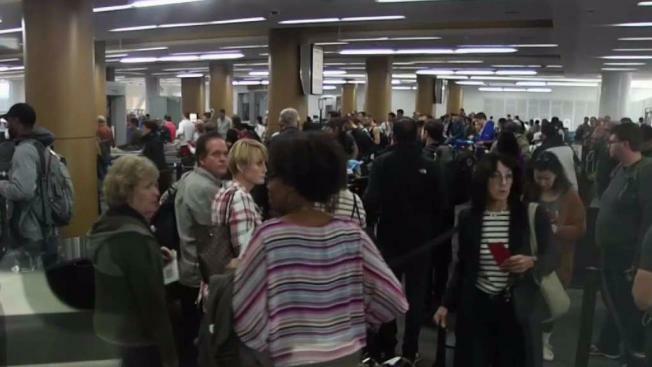 At about 3:10 p.m., a breach at one of the security checkpoints in Terminal 2, which serves domestic flights, prompted the lockdown, airport spokesman Jeff Figone said. The breach was caused when a passenger entered the terminal through an exit door and started walking through the airport. He then walked through to the gates then went back to a security checkpoint, Figone said. San Francisco police detained and questioned the man, and K-9 units sniffed his trail to try to detect anything suspicious but didn’t find anything, Figone said. The brief lockdown caused a massive backup in the lines at the TSA security checkpoints in the terminal.